The first step is quite logical. It involves choosing a proper site for holding a logo contest and an appropriate price tag for your logo design. Once the first step is covered, the second step is to provide the designers with as much relevant information as possible in order to create a good logo. In other words, you will need to map out the contest in brief. The third step would be to enter as many details of your logo as you can so that the core idea reaches the designers. For them to bring your idea to life, they will need a description that is as close to your vision as possible. You could start by introducing your company, the kind of business you are in and the attributes that should be present in the logo so as to help enhance your business potential even further. You will also need to tell the designers about your competitors and how you would most definitely want to avoid having a similar logo to the ones your rivals use. The fourth step would be to specify your colour combination preferences; the ones that you like and the ones that are unacceptable. Read more about colour psychology and logo design here. The fifth step is interesting, as it would define the style of your logo. How would you want people to perceive it? The final and the most important step would be to pick up a few readily available logos that you like (they don’t need to be in the same niche) and attach them with the contest brief as examples. If there is no option to upload files, you could simply post links. 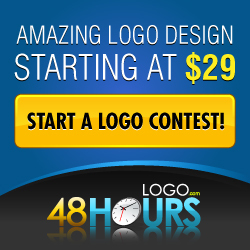 This will help designers to create a logo that will suit your needs. Double check your brand name for spelling mistakes. The same goes for a tagline or slogan, if you have one. Imagine a situation where you are holding a logo design for your company with a winning concept at hand, but you are hesitant to show it to your boss or company partner because your brand name has been misspelled. The reason could be anything, from your negligence to the designer’s ignorance. Similarly, presenting a new logo to your supervisor will only lead to incoherence and delays. Such embarrassing situations are commoner that you would think and I have seen such occurrences a dozen times! For example, a contest holder requesting the designers by saying, “Please swap ‘x’ for ‘y’, the company name is…” Such situations are avoidable if you carefully inspect everything during your preparation stage. Consider guaranteeing the money: You have two options before holding the contest. The first option will enable you to withdraw the money if no design suits you. The second option will guarantee that you will pick a design. In other words, the money is guaranteed. Choosing the second option will bring you a lot more attention and a lot more logo designs. Provide feedback: Once you submit your idea and the contest starts, the first eager designers will begin submitting their designs. At this stage, it is very important to give proper feedback. Instead of simply restricting your comments to ‘good’ or ‘bad’, you could describe what you like and dislike so that there is transparency between you and the designers. Explain how the logo could be made even better. This will help the designers to strive towards perfection. Be more active: Once the contest progresses ensure that you keep a regular check on the designs. Instead of letting the contest run on its own, be an active participant in the process. Once the contest is over you may not be left with any design that you like. This will lead to a significant wastage of time. As the logo design contest progresses, the designers will keep improving and tweaking their designs and you will be on the lookout for a winner. One of those designs will stand out as the best; the one that fits into the contest brief perfectly and the one that has innovatively brought your vision to life. You would always want your company to be ahead in the race and stand out among competitors. A unique logo that perfectly represents your company’s values is one way to ensure that you are always a winner. Before deciding on who wins the final round, you should be aware of overused logos and stock designs. You can see the most commonly overused logo designs here. The primary problem with using a stock image is the issue of copyright. You don’t own the bee image and if your rival company decides on using it, you can’t really do much about it. There is one quick way of uncovering stock images in your logo. Go to www.google.com and search for “bee vector” or “bee stock” on images tab. This will not guarantee complete insurance but will help to an extent. Scroll down a couple of pages and see if you can find a similar image to the one in your logo. Another way to keep a tab is to search similarly on sites that sell stock images. The only problem is there are dozens of such sites and it will take ages for you to carry out a complete search. Greyscale: Your logo must look good in greyscale. Ask your designer to provide the black and white version of your logo. Ensure that both the coloured and the black/white versions are recognizable and the text reads well. Good use of negative space can be of great advantage to your brand. Last but not the least, your designer should be familiar with golden ratio to make the logo well balanced and pleasing to the eye. What is visible must appeal to the people who see it. Timelessness: This is probably the most difficult thing to do. Every time you rebrand and change your current logo, people get confused. Constant chopping and changing reduces the face value of a brand. A logo needs to retain its appeal and be timeless so that people recognize it tomorrow as much as they do today. Evolution is acceptable but continuous changes might be bad for your business. See evolution of logos here. A logo design contest brings out the best in people. The ones who are truly passionate about their work will give their best to this competition. While they do their work well, your work becomes easier and your company has better chances of standing out in an industry filled with logo brands. This article has aimed at providing you with tips and techniques followed within the industry. This will hopefully help you in approaching a contest in the best way possible and in choosing the design that suits you perfectly. A logo represents your company and the best way to place your business in a positive light is to work on its face value. It is not for nothing that they say, “First impression is the last impression”. Conduct a contest, actively participate in it and pick the logo that will impress people for generations to come.